Ten days ago, the Pakistanis gave in to the Taliban in NW Pakistan by agreeing to institute Shariah law. The Taliban quickly took that deal simply because, as they themselves said, Shariah law is their main goal. Most in the West are completely ignorant of the central role that Shariah plays in our enemies’ entire strategy and ideology. 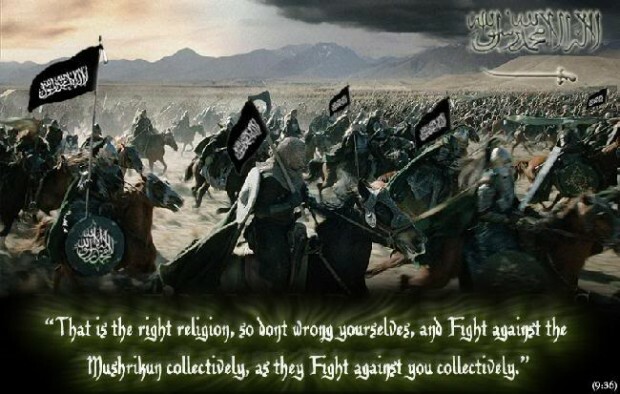 The Jihadists don’t necessarily want us to convert to their form of Islam, but they absolutely do find it necessary for Shariah law to the the supreme law of the land the world over. Cliff May of the Foundation for Defense of Democracies has an interesting column in the Washington Times today about Sayyid Imam al-Sharif, aka Dr. Fadl. “Dr. Fadl” was an original ideological supporter of Al Qaeda who has since become critical of the terrorist organization. He has just written a book with some sharp attacks on Ayman al-Zawahiri, the man we are pretty sure heads Al Qaeda. Finally, Dr. Fadl provides what may be a key insight into how we should fight this war. He says that whenever infidels defeat Muslims, there can be only one explanation: Allah has allowed that as a punishment for the Muslims’ sins. Worth remembering the next time someone tells you that winning battles gets us nowhere, that it only makes martyrs of the militants.